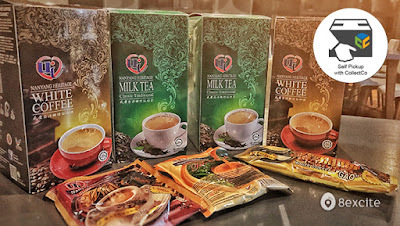 Just the aroma of Yu Ai's Nanyang White Coffee is enough to keep you going and it gets even better after consuming it. If you are not a coffee lover, don't worry as Yu Ai also got you covered with their tasty Nanyang Milk Tea. This sweet and savory drink will definitely quench your thirst. Please select the pick-up point correctly upon purchasing the deal. Your selected pick-up point cannot be changed afterwards. Please show the SMS at the pick up point to collect your goods. Please collect your goods within 1 week once you receive the collection SMS. In the event that you cannot collect your goods, you will be refunded in Excite Points. For any pickup related inquiries, you may contact CollectCo Customer Service at http://collectco.my/support. Kindly do not contact the pickup points directly.